TEL AVIV (SpaceIL PR) — The construction of the first Israeli spacecraft is at a critical turning point. Only two weeks before its completion, $20 million are needed by the end of the year to prevent the project’s termination. This would result in the cancellation of the launch planned for 2018 and end all the non-profit’s educational activities, a moment before the spacecraft is launched. The total sum required to complete the project is $30 million. Businessman and philanthropist Morris Kahn has pledged an additional $10 million, if $20 million are raised from other sources. SpaceIL officially announced today that without immediately raising $20 million, they would not be able to complete the project of launching the first Israeli spacecraft to the Moon, The non-profit was established about seven years ago with the aim of launching the first spacecraft to the Moon, as a contestant in the global Google Lunar XPRIZE competition, and has pledged to donate the $20 million prize to the advancement of scientific-technological education in Israel. To date, the non-profit has raised a sum of $55 million, but to complete its mission, it requires a total of $85 million. Over the past few years, businessman and philanthropist Morris Kahn, who until recently served as SpaceIL’s chairman of the Board, has donated approximately $18 million. Mr. Kahn has pledged a donation of a further $10 million, if the remaining sum ($20 million) will first be raised from other donors and from the government. Israel is primed to be the 4th country to land a spacecraft on the Moon, a feat accomplished thus far by only the USA, Russia and China. Its success will inspire immense national pride, and will reinforce Israel’s prestige as “The Start-Up Nation” in the international arena. Anchored in the “can-do”, innovative approach and creative energy that has characterized the Jewish State since its founding, SpaceIL aims to replicate the “Apollo Effect” in Israel, inspire and motivate the next generation of Israelis to pursue a future in STEM professions. Since its establishment as a nonprofit, SpaceIL has pledged to donate the $20 million in prize money, if it wins, to the promotion of science and scientific education in Israel, and to thus contribute to Israel’s economy and security. Since its founding, many have contributed to the project. The main donor is the Dr. Miriam and Sheldon Adelson Foundation. Additional supporters include Morris Kahn, Sami Sagol, Lynn Schusterman and Steven Grand, among others. The project formed exceptional collaborations between the private sector, the academia and governmental companies. Israeli Aerospace Industries (IAI), the Weizmann Institute of Science, Tel-Aviv University, Israel Space Agency, Israeli Ministry of Science, Bezeq, dozens of engineers and hundreds of volunteers are among SpaceIL’s partners. Over the years, SpaceIL volunteers have reached half a million children and youths throughout the country. In October 2015 SpaceIL reached a dramatic milestone, when it became the first team to sign a launch contract, becoming a competition finalist, alongside teams from India, Japan, the USA and an international team. The launch of the SpaceIL spacecraft on a SpaceX rocket is expected in the coming year. It should be noted that the terms of the competition stipulate that the government can increase its financial support to a total of $8.5 million. 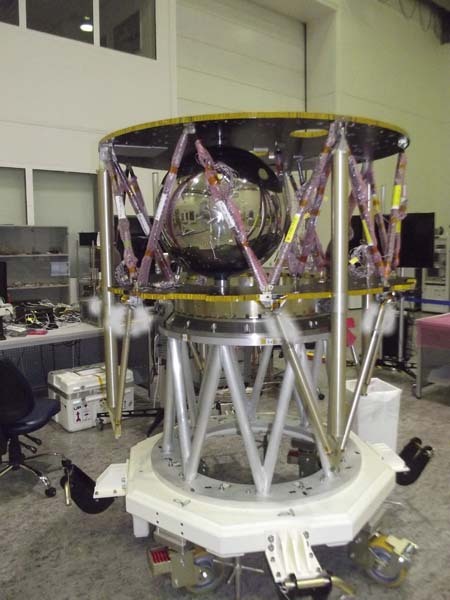 The spacecraft is presently in the final stages of construction (integration). During the coming two weeks, the final phase of the preparation for launch is scheduled to commence at the IAI facility – the testing phase. All the work done thus far will be to no avail if the required funds are not raised.